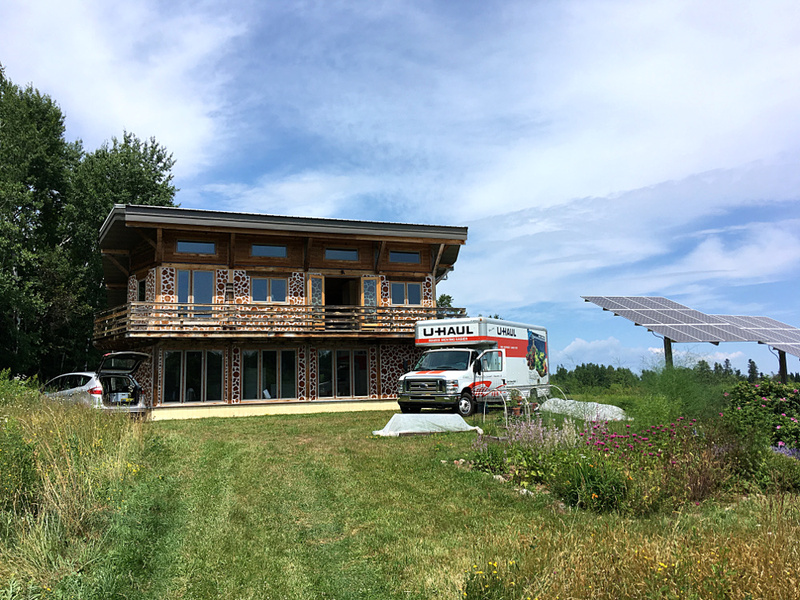 Most people who build their own cordwood home seem to take a couple, three years to finish. I figured it would take us five. Well, ten years and eleven months after we broke ground, we finally moved into Nerdwood. And we’re not quite done with it yet. By June of 2017, we had less than two months to get done whatever we could on the house, while packing up our apartment. I had run the drain plumbing to the second-floor bathroom, but we also needed to put in supply piping and electrical before we could drywall the bathroom and closets. If nothing else, we were determined to have the drywall done and painted, because who needs to deal with that mess while living in your house? This winter, we made a decision that it was time to set a date to move into Nerdwood. We’re getting close enough to finishing that a firm date would inspire us to push, and push hard, to finish at least the basics needed to live there. Not only are we itching to live there, but since we are renting an apartment while we work on the house, actually living there will save us a big chunk o’ change every month. We had wanted to be DONE done by the time we moved in, but let’s face it, 10+ years is long enough. We can finish after we move in. Our apartment lease runs out at the end of July this year (2017), so we told out landlord that we are not renewing. Yikes! Now it’s for real. We’ve made a list of things that absolutely must be ready by the time we move in. Stairs, the top layer of flooring on the second floor, maybe a few appliances, like a fridge, stove and washing machine. Oh, and first order of business, a real bathroom. At the end of the last post, we were rinsing and scrubbing, scrubbing and rinsing, after acid-staining the floor. According to the instructions, we had to keep rinsing until no more residue remained. This turned out to be a LOT of scrub-rinse-repeat. Our test patch took eight cycles, and, as it turned out, the entire floor took at least that many. After working upstairs for a while, we decided to turn our attention to the downstairs. 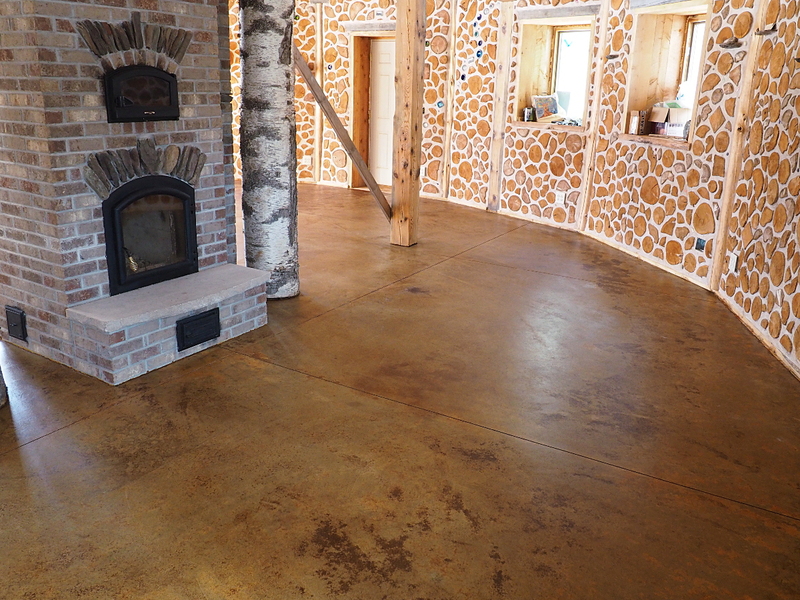 We had planned all along to stain and seal the concrete floor, because we like the looks of a stained concrete floor, and because it allows the in-floor heat to work in the most efficient way possible, with no other floor coverings getting between the heated tubing and our toes. Another important benefit of staining and sealing is that a darker floor will absorb more heat from sunlight, maximizing our passive solar gain. The first order of business was clearing the floor – not an easy task, as it was covered with stacks of wood, piles of boards, towers of logs, tools, more tools, shelves, slabs of wood, and wood. Years of accumulated stuff. We moved stuff upstairs, we moved stuff to the porch, the shed, and to our storage unit. Since we will be tiling the first-floor bathroom (so it doesn’t need to be stained), we put the table saw and a few other very heavy things there. I even sawed off the little nubbins of rebar sticking out of the slab from when I mis-measured ten years ago. Damn you, younger Greg! Finally we had the slab cleared and we could start cleaning it. Time to put in a real second floor, one that doesn’t have bits sticking out or weak spots that startle you when you walk on them, like the temporary plywood floor did. Temporary, as in it was only there for eight and a half years (!). 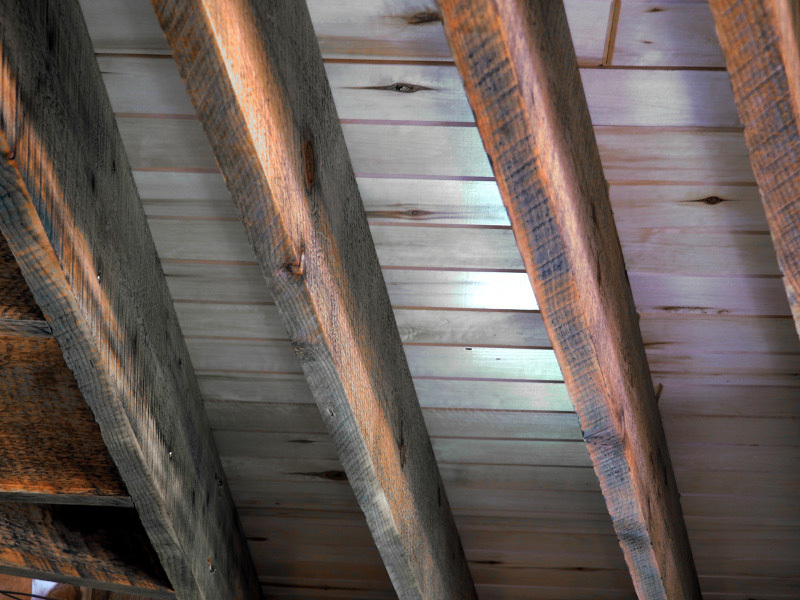 Since the floor will be visible from below, between the joists, it has to look good on both sides, top and bottom. We had originally thought we would use a single layer of inch-and-a-half-thick planks, but none of the millwork places around here could do that unless we bought them knives for their milling machines, at a price of many hundreds of dollars. Instead, we decided to do the floor in two layers – a bottom layer of local aspen, the exact same stuff as we put up on the ceiling, and a top layer of local maple. Each layer is three-quarters of an inch thick, giving us the same total thickness as we had originally planned. 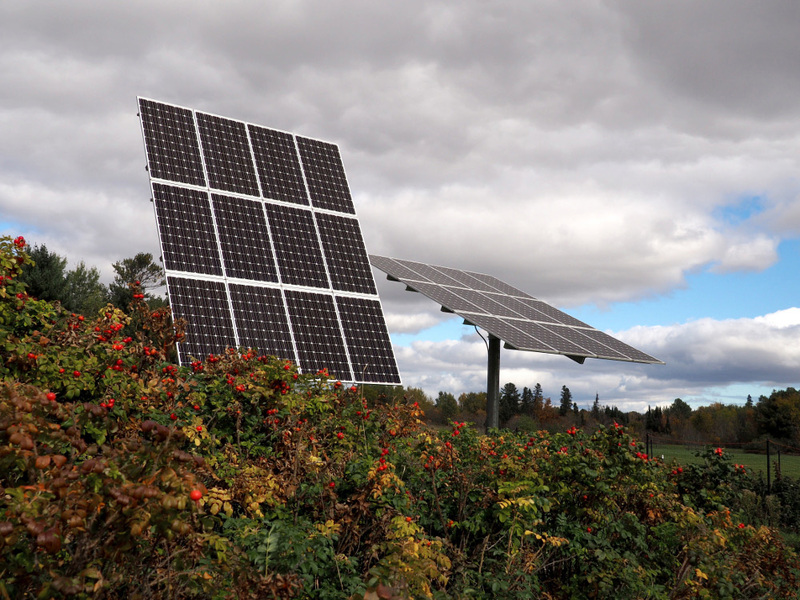 As the days grow shorter and the sun travels much closer to the horizon, we realize it’s time once again for that festive biannual event, the tilting of the solar panels. Although we are hard at work on the interior of the house, we still have to find time to do many routine maintenance tasks. We struggled with this the first couple of times, but now have a method which takes about thirty minutes total. All it requires is a calm, windless day. Now that all the framing members are sanded, it’s time to finish them. Clare and I have been looking into natural finishes for Nerdwood, and rather than use polyurethane, we decided to use linseed oil, which is an oil derived from flaxseed. 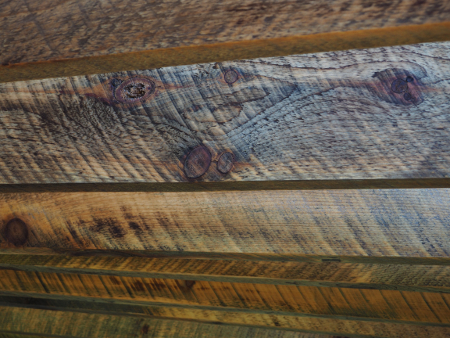 It’s a drying oil, meaning it soaks into the wood, then dries slowly to a hard finish. It also yellows and darkens somewhat over time, which is desirable in a semi-rustic house, in my opinion. The only real drawback we’ve read about is that it’s not a very tough finish, and doesn’t resist abrasion very well, which makes it unsuitable for finishing, say, a floor, or your in-home bowling alley. That’s not really a problem for the posts, beams, and joists we are using it on; we’ll be unlikely to be doing balance beam routines or walking on the ceiling. Spring/early summer of 2016, and I’ve been doing some sanding. OK, a LOT of sanding. But before I get into that, here are a few things Clare’s been up to while I kick up the dust. Once we finished cordwooding the house, it was time to start working in earnest on the interior. Clare and I decided it would be best to start the finish work upstairs and work our way down, so that the mess would fall into the as-yet-unfinished first floor, rather than on stuff we had just finished. During the fall and early winter of 2015, our friend Matt had some time to give us a hand (fortunately for us! 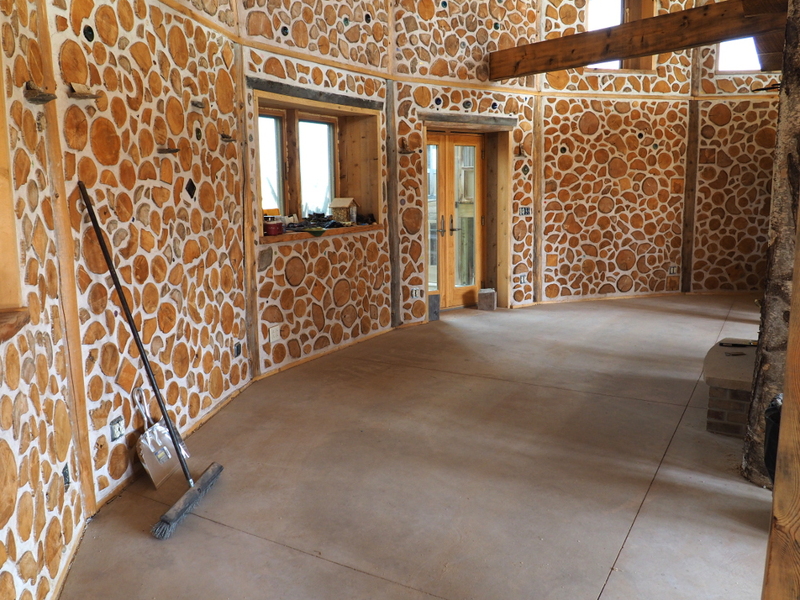 ), and he framed out the area above the second-floor cordwood walls. He then drywalled the whole area, aside from where the second-floor bathroom will be – since we decided not to put any cordwood walls in the bathrooms, we’ll be finishing that room separately. Clare and I took over at this point, painting the drywall, and putting up trim that I made from leftover cedar boards. Most of the second floor looks pretty well done at this point, as long as you don’t look down at the temporary plywood flooring on the second floor. As it happened, 2015 was the year a number of chapters were closed. One chapter closing, that of my Dad’s life, was particularly sad. He was a big fan of Nerdwood and would have loved to have seen Clare and I move in. At least he went out with a whole lotta love all around. There were some chapters that were much happier to close. I finally got my degree (Bachelor’s), and managed to do so before all my hair fell out. More salient to this story, however, is that we finished the last of the cordwooding, at least in Nerdwood proper.